Have you ever seen it? If not, I recommend that you do. The other part is of a boy dealing with pain and trying to find his way in the world. And the joy of seeing something inspire him and awaken a purpose for his life. This is a very inspirational movie and one that even a 4 1/2 year old can watch. It was so nice not to have to say, “Ian, cover your eyes,” or “Ian, cover your ears.” I like finding a family movie that we all enjoyed. Ian was fascinated with learning about the dolphin, the seagull, and other sea creatures. He also enjoyed watching what the kids were doing. This movie kept his interest the entire time. And, if you have a young child, you know how rare that is! 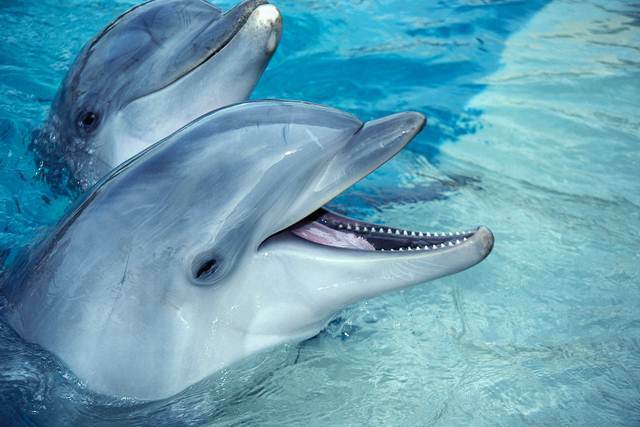 Dolphin Tale starred Harry Connick, Jr., Morgan Freeman, Ashley Judd, Kris Kristofferson, and two great child actors, Nathan Gamble and Cozi Zuehlsdorff. This is a great cast who worked very well together! It was great to see a movie that celebrated teamwork in a good way, showed dealing with hard issues in life, learning on others, and dealt with prosthetics. One of the lessons from this movie is to never give up no matter what happens to you. People who have lost limbs due to war, illness, or a variety of other reasons can sometimes be made to feel less of a person. Or people gauk at them because they are different. Instead, as this movie conveyed, it’s okay to be different and that you can still do what you want. It may just need to be done differently. And, there is nothing wrong with that! Another lesson that I gleaned from it is that people can do amazing things if they believe that they can and go for it! Circumstances and obstacles don’t have to stop you from succeeding. And, one other lesson, is for adults to try to live more like a child. In other words, try to live in the moment and try not to think of all the reasons why you can’t do something, but instead focus on the fact that you can. I hope and pray that I can put these lessons into practice! Please share your thoughts and how this movie inspired you. “Everybody’s working for the weekend.” — lyrics in a song by Loverboy. That is a great song but is it true?! Is that really what we are working for? Don’t get me wrong, I do enjoy my weekends and the routines being slightly different. However, having a son who is pre-school age has helped to learn to appreciate each and every day. Kids are great at living in the moment and truly making it the best it can be. Children treat each day as the gift that it is and open up its possibilities like a present. I wonder why we as adults have such a hard time with that. 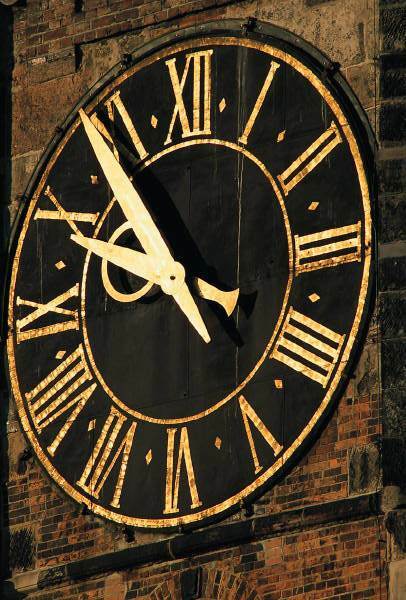 We are always watching the clock: “Is it 5 yet so I can go home?” Or we are wishing our week away to get to the weekend. Or we are so looking forward to a concert or vacation, that we miss the days leading up to that special occasion. This summer I am doing my best to savor and appreciate each day that I am given. Things are new every morning and each time we awake from a night of sleep is a gift. I hope that you too can realize that each day is a blessing and make the most of it! Hi to you! 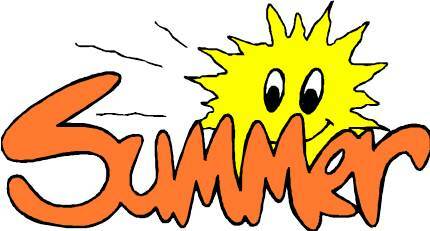 Hope you are having a great first official day of summer! Looks like it will be hot in a large part of the country today! Try and stay and cool. Our first day is so far so good. This morning we watched a show about the Duggar family (which had 16 kids at the time of this special) as they went on a road trip to Disneyland. It was amazing to see the stuff they took with them — just food and clothing overfilled their motor home. They had to move some items to a separate trailer just so the motor home could go up the hill. Ian was fascinated watching their adventures and trying to understand that many people in a family. We’ll be enjoying a family reunion this summer with nearly that number in a small house. So, we’ll see what it’s like. Should be fun!! As you know I have been working on losing weight. This week my sister-in-law gave me a great suggestion for an exercise video. I am going to see if I can find it. I like being able to exercise at home or in my neighborhood so this will fit in nicely! Over the last few weeks, I haven’t been losing very much weight, but I have noticed that my body’s shape is changing. And for that I am happy. Some of my clothes are fitting better and are more comfortable. I have to remember that the changes aren’t only on the scale. In addition, the exercise is getting easier and I can do things for a longer period of time. My baby steps seem to be working! This week, my husband has made Ian a house out of a cardboard box. They added a mailbox, doorknob, hook for a jacket inside, and a lock. And, Ian has keys. He is having a great time with his house. And, learning the responsibility of keeping up with his keys is really important. He has drawn a few pictures on the walls — one of a big truck and the other of clouds in the sky — including frames. The guy time has been great for them and also for me. Hope you have a great rest of the week! Please share some of what you are doing this summer! I would love to hear from you! That is a quote about the best kind of father. I was blessed to have one like that! And, I love you Dad. Happy Father’s Day to you! 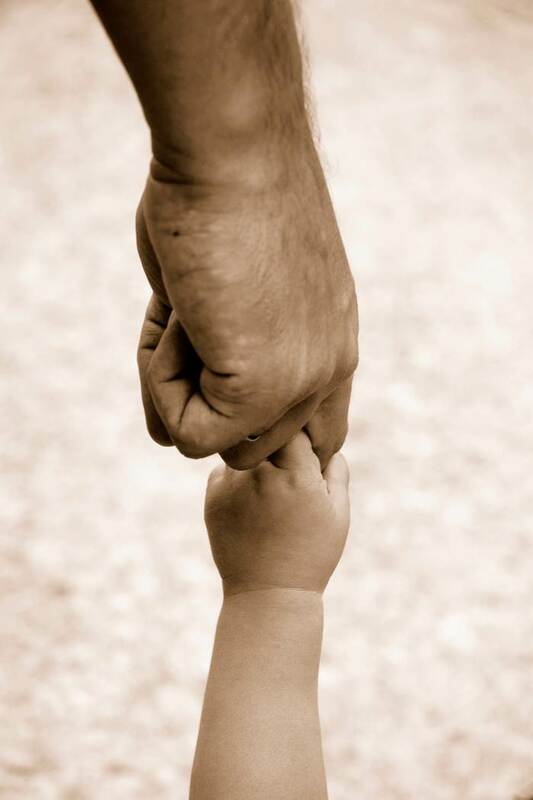 Today, I hope that you have had a wonderful father’s day! Mine has been great so far. I went to church with my husband, son, and father-in-law. We had a great service and enjoyed communion together. And, the choir sang a gorgeous blessing that was sung at our wedding. It was great to be with my father-in-law at his church. We then went to lunch and enjoyed a great variety of yummy food. And, the guys opened their cards. Ian drew pictures in everyone’s cards so they were extra special. He has become quite the artist. Today, it has been great to celebrate with my husband. I love him and am so glad to be married to him. He is a friend, my love, and someone I enjoy being with. And, he is a wonderful father to our son. He truly loves and cares for our son and we are so blessed. They have a special bond. This afternoon, I talked to my dad on the phone since we couldn’t be together today. He enjoyed the card we sent him and Ian’s artwork both on the card and the envelope. My dad has always been the greatest father and always so loving and kind. And, he always truly listened to us growing up. I was frustrated that we couldn’t be together but we will be soon and can celebrate then. I am blessed to have men in my family who are great fathers! My brother and brothers-in-law are all wonderful with their children, as are my cousins, uncles, and friends. Happy Father’s Day to all of you! If your father, our spouse who was a father are in Heaven, I hope and pray that you can remember the fun you had with him and enjoyed having him be a part of your life. Thank you Lord for giving fathers the ultimate example. Today is Friday, June 15 — halfway through June already. Where has this year gone? It seems to have flown by. And, we are days away from the official start of summer! The summer solstice!! It is already summer to me. I always enjoy this time of year. It has been a few weeks since I have written about things I am thankful for. Life has been quite busy for me but I still have a thankful heart. Having Ian choose his first hairstyle that he wanted and his excitement over his haircut. That is a first! Enjoying a fun birthday lunch with my sister (the birthday girl) and family. Walking with family and taking great pictures. Checking out another book from the library by a favorite author. Enjoying a meal with my husband and son. Planning for a trip to the beach. Seeing Ian’s excitement at his first baseball game. Having my weight stay the same (that is better than gaining) over a few crazy weeks. Knowing it’s the time of year for fireflies, ice cream trucks, swimming, and later nights. What were some of your highlights? Please share them with me and the other readers. Hope you have a great day and weekend!!! I have always liked the summer. There is more time to slow down and enjoy life and get outside and be active. This summer, we are enjoying walks in the evening around the neighborhood while Ian rides his tricycle. It’s still early enough, that the humidity isn’t too high yet. Later in the summer we have to either be inside in the air conditioning or enjoying some body of water. We enjoy the chance to go swimming at the pool, be on the lake and a friend’s new boat, or go to the beach. Not everyone likes the beach, but I always have. There is something magical and calming to me about the ebb and flow of the waves. When I am stressed and can stand and look at that water and feel the breeze and breath deeply, it just calms me down. How about you? In fact, the background picture on my computer is a photo of me at the shoreline. Each time I look at that picture, I smile and remember a fun time and marvel at the beauty of the sun, waves, and sand. Over the past five years, I have been fortunate to go with my family to two very different but equally fabulous beaches. The first was on Hutchinson Island in Fort Pierce, Florida. This was the first beach that Ian went to as a baby. He was fascinated at the feel of the sand in his fingers and on his toes. 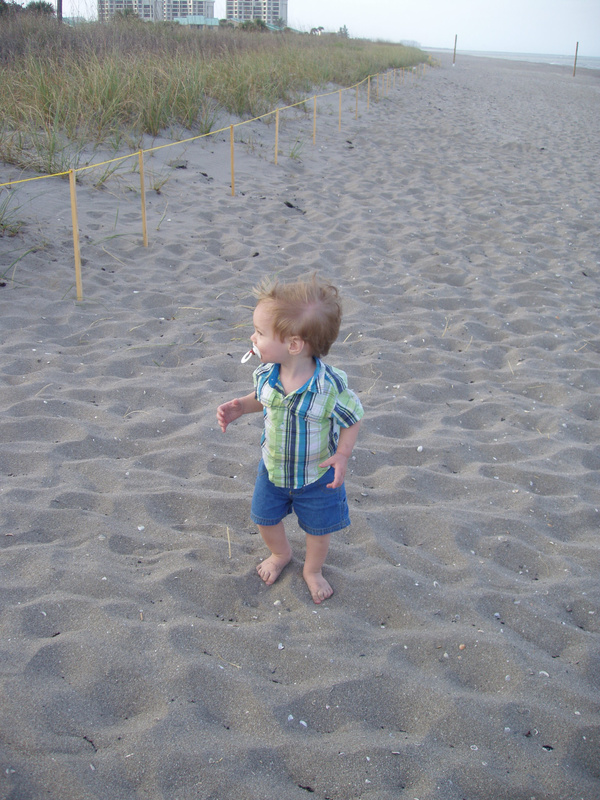 Here he is exploring this beach. This is a great shelling beach and I have found a vase full of gorgeous treasures. Each time I went to the sand, I came back with my pockets full of shells. Only residents and visitors would go to this beach since it was right in front of a community. So, there were times when we were the only ones there and that was quite special. Also, the water was a lovely turquoise color and the waves were calm enough to have Ian get his feet wet as he got a little bit older. 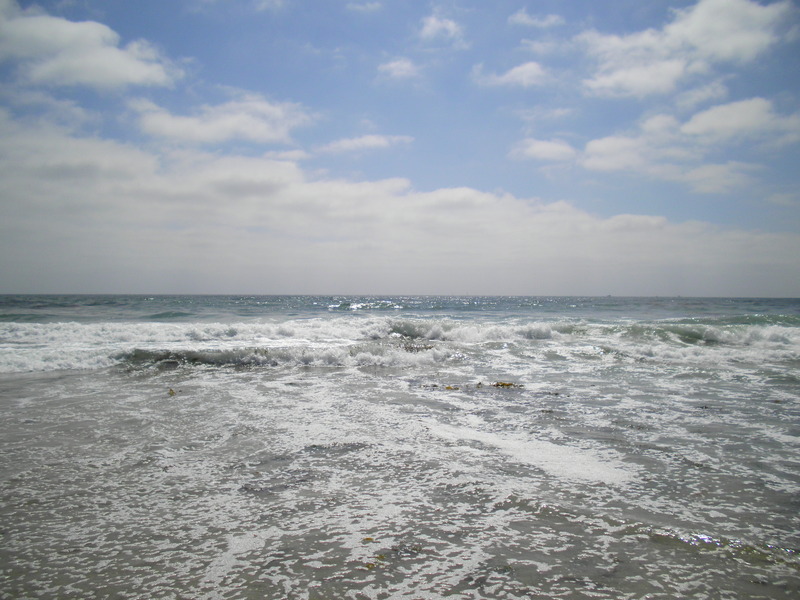 The second beach is Mission Beach in San Diego, California (pictured at the top of this blog). I have told you about this beach many times. This is the one my family went to as I was growing up. I have photos of when I was about 6 months old at this beach. And, there is a picture of me crawling very quickly towards the water. At this beach, there is a lot of seaweed, very strong waves which are great for surfing or body surfing, and chilly water. It is perfect for a hot summer day to take a dip in this water. You come out feeling reinvigorated. I have always liked a sunset into the ocean and have seen hundreds of them over the years. And, I grew up wearing a sweater at sunset since it always cooled down just a little. The first time that Ian went with me to this beach was incredibly special and I realized how blessed I was that we now have four generations of our family who have enjoyed that same sand and surf. Whatever your favorites are in the summer, I hope you can enjoy them to the fullest! It is a great song, but not my thoughts at all. I am fine with a rainy Monday, especially after the gorgeous and sunny weekend that we had. Rainy days are a nice time to read a great book inside, or play a game, or listen to a favorite song and dance all over the house. Or, if there is no lightning and thunder, it is fun to play in the puddles! And, have you noticed that after a rainy day or two, you often have a day that is absolutely beautiful and sometimes a rainbow comes out? It seems that everything is brighter. My thoughts and prayers are with those in the gulf who received 22 inches of rain over the weekend. Now that is way too much. I saw a picture of a person kayaking in a parking lot. So much not right with that image. Stay safe and dry and hopefully we’ll see a rainbow today! I wonder if we will!! Today is my sister Cindy’s birthday! Happy Birthday to you sis! Love you. She is younger than me by a few years so there were moments growing up that we just didn’t get a long. But now we do and she is a dear friend and one of my biggest champions. 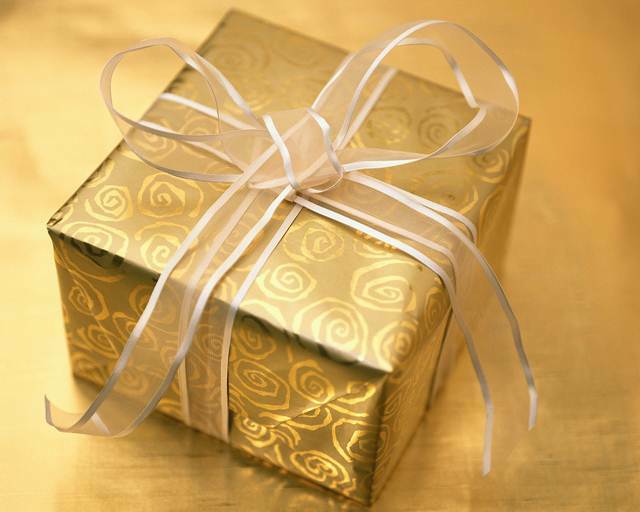 And, that is truly special and a real gift. Now, we both have kids who all get along and enjoy being together with each other and their cousins. And, our husbands have the same birthday. How weird is that?! This photo that I chose is a real oldie, but one of my favorites of the two of us. Cindy is the blond ready to take on the world. I am the one just posing so meekly. This was one of our early visits to the beach in San Diego, California. We enjoy the matching outfits and shoes — well they are fun to look at anyway. 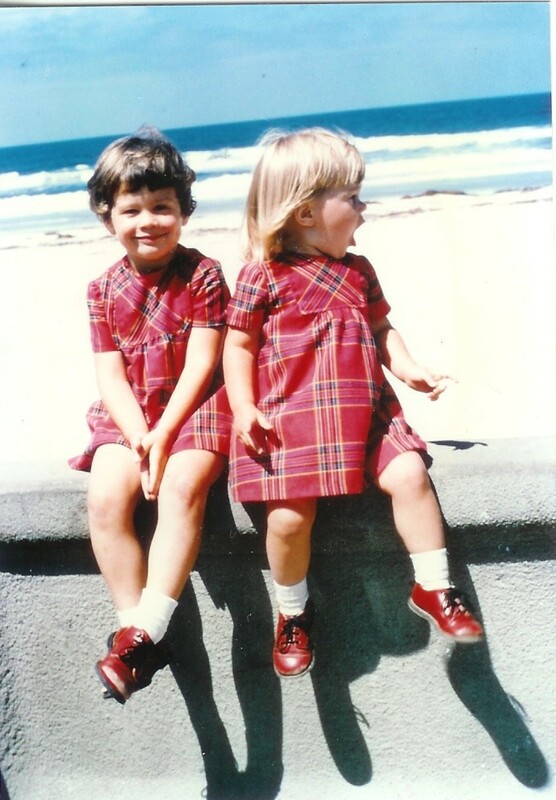 When Cindy’s daughter was about this age, she put her in the same outfit and got a picture at the same seawall. This summer we look forward to our families, our brother and his family, and our parents taking a trip to that same beach. More wonderful memories will be made and many more pictures taken as well! Cindy married before I did and had kids before I did. She also gave me some wonderful advice and shared some of her experiences. What I learned from her about early childhood was so helpful as I was raising Ian. She is beautiful on the outside and also the inside. She is kind, loving, lives by her faith, very intelligent, and fun to be with. I am glad to have her in my life. Cindy truly enjoys her life and makes the most of it! Throughout my life I have learned so much from her and am so pleased to have her as my family! She has helped me on many occasions in a variety of ways. For example, she learned my part in a play in one week and performed it brilliantly when I wasn’t able to. We both love to laugh and we both cry and are emotional at times. We are not afraid to show our feelings. And, we are blessed to have grown up in a tight-knit family. I have so many amazing memories with her — family camping trips and a trip cross-country, Vacation Bible School, Camp Fire adventures, writing a play for her drama club’s senior year performance, sharing a bedroom for many years, being maid-of-honor (or matron) in each other’s weddings, celebrating the birth of our children, and grieving the loss of our grandparents together. We have known each other our entire lives and I for one am so thankful for that fact! You have been a blessing to me for many, many years, dear Cindy and I love you so. We both love the song “Sisters” from White Christmas. “There were never such devoted sisters.” And, I truly think that we are. Despite the fact that we don’t talk each week, there is a bond and a continued friendship that I truly cherish. For my sister with the golden locks, I wish you the best of happy birthdays. I hope you have another amazing trip around the sun! Can’t wait to join you on that adventure! This morning I saw a story on the news that gave me pause. A woman was explaining a situation she was in that in her mind was unforgivable. I can totally understand how she would feel this way. You see, her daughter was killed in a hit-and-run car accident. And, her daughter was pregnant at the time of the accident so she lost two loved ones. She did say that the man who caused the accident ran from it, went home, cleaned up his car, and then went on with this life with no apparent thought or conscious about what he had done. She mentioned that she could have forgiven him if he had owned up to what was done but instead he ran away. Thankfully he has been arrested for this crime. I feel truly awful for this woman who lost so much in such a senseless act and can totally feel for her. As a mother, I could not even imagine the pain of losing a child. And, I too would be truly devastated. The fact that she even said she might have been able to forgive is amazing to me, considering what happened to her family. Forgiveness is truly one of the hardest things ever in life since it means having to come to terms with something that is often the absolute worst in one’s life. Can we truly do this as Christ calls us to do? Can we forgive someone when they have taken something away that is the most precious thing in our life? Truly we don’t know how we would feel until we are in that situation. And, sometimes it takes years, if it can ever be done. And it also made me stop and think, are there things which are unforgivable? What do you think? As I mentioned, we are called by Christ to forgive one another. But that is a very difficult thing to do. To let go of the pain and the anger is a real challenge. And sometimes it takes each and every day for years to see if we can forgive. And sometimes in life we may never get there. But I think the thing to remember for our own sanity’s sake and our own well-being, is that we do have to try. Otherwise we can be eaten up by the hate and the anger and the loss. And that is no way to live. My own family has been dealing with a terrible loss which is very hard to forgive and let go of. We are struggling with it each day. My sister-in-law was brutally murdered during a home invasion while my brother-in-law (my hubby’s brother) was away on business. I wasn’t very close to them but still feel the loss and have seen the effect on our family. During the crime, my niece was seriously injured but thankfully and amazingly did survive. She and her father have been a true inspiration to me as they have dealt with this horrible situation. They are coping the best they can and have even started a scholarship for nurses in my sister-in-law’s name that is helping people in the profession that she loved so much. Wow, what a great thing to focus on. They also worked to change the law in their state for such a crime to include the death penalty as a punishment. This wasn’t in place at the time. However, four young people were found guilty of these crimes and are in prison for a long time to come. I don’t have the answers to forgiveness but know beyond a doubt that it cannot be put into practice without God’s help. To do this on our own with our own human minds just doesn’t work. Do you have thoughts on this? Please share them. Here is a quote that sums up to me in a nutshell what forgiveness is. It is from the http://www.livelifehappy.com web site. If you are dealing with a situation that to you seems unforgivable, my hope and prayer is that you can remember a quote like that. It may just be what you need to hear. I know that it has been for me. Hope you are having a great Wednesday, also known as hump day. I like this middle day of the week with three days before and three days after. It is a good day to stop and think about how things are going and hopefully enjoy where you have been been and where you are going. By now, hopefully we are in our groove and can coast until Friday! Then it’s the weekend. I realize, however, that isn’t always the case since some weeks just don’t go well. And sometimes the week is so busy that today is like any other day. But I always like knowing that on a Wednesday, I just have 2 days until the weekend. We love our weekends, although sometimes they are as crazy as the rest of the week. A change in routine is nice! Hope you have a great day and a wonderful rest of the week! !